The line wasn’t just a veiled threat at Hillary. It was a glimpse of Trump’s true feelings about his supporters. 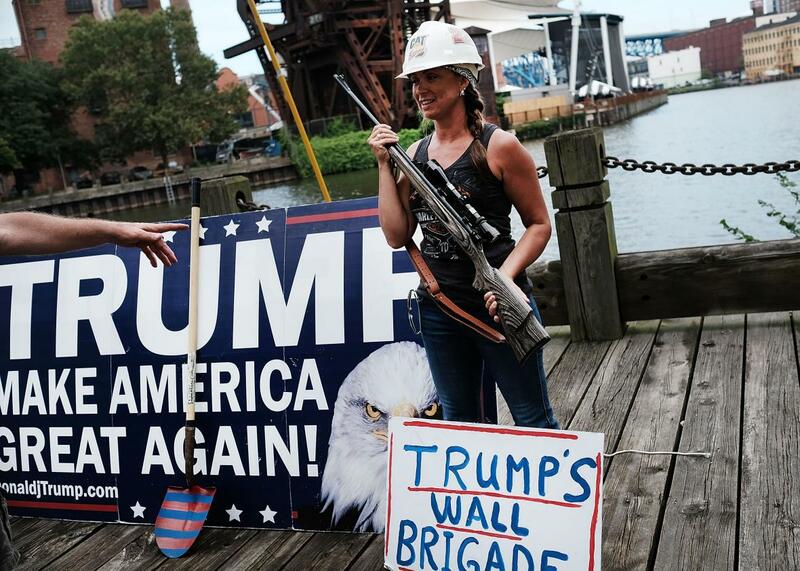 A Donald Trump supporter poses with a gun while attending a rally for Trump on the first day of the Republican National Convention in Cleveland. Donald Trump’s joke about “Second Amendment people” having some options if Hillary Clinton wins the presidency and appoints anti-gun Supreme Court justices has been described as a thinly veiled assassination threat. While the campaign is insisting that Trump was merely referring to the spirited engagement of gun rights advocates, many have argued that, regardless of Trump’s intent, the remark could be heard by some of his supporters as an invitation to commit acts of political violence. This is correct. But then, Trump makes dangerous, reckless comments all the time. The more revelatory, less familiar thing about his outburst on Tuesday is that it represents the rare instance in which he accidentally let slip the disdain he feels for much of his fan base. Peeking out from behind these words is an unintentional truth: that for all the noises Trump has made throughout this campaign about the sanctity of the Second Amendment, he actually believes that gun enthusiasts are crazy. That is the subtext of the phrase “Second Amendment people”—a construction that is used to delineate a group of people who are in some way ridiculous and don’t deserve to be taken seriously. “Get a load of the Bernie or Bust people over here.” “Oh, Teddy? He’s one of those Saab people.” “Oh no, don’t tell me you’re one of those water bed people.” And so on. When you use this phrase, it means you think the “people” have dumb or at least outré preferences and don’t deserve to be taken seriously. There is something almost impressive about how rarely Trump has betrayed a lack of respect for the people who are voting for him. As resolutely off-message as he’s been, there have been only a few moments when he has allowed a sneer to sneak past the populist rhetoric that has defined him. One time was when he told the New York Times about his strategy of mentioning “the wall” whenever his audiences get bored. Another was when he said he could shoot someone in the middle of Fifth Avenue and not lose a single voter. He did it again on Tuesday. So while he deserves every bit of condemnation he receives for joking about assassination in such a cavalier way, it would be a shame if people missed the deeper revelation here. It’s not every day that Trump accidentally tells the truth.